Yellow Lab- Sporting and hunting dog. Intelligent, even-tempered, kind and outgoing. 100% cotton Personalized Dog Throw is a cozy, beautiful way to celebrate your dog. Top quality embroidery and stunning images of your favorite breed will look great in your living room or den. The throw will keep you and your pooch warm while you cuddle and watch TV or read. Add your dog's name or your family name up to 12 characters. 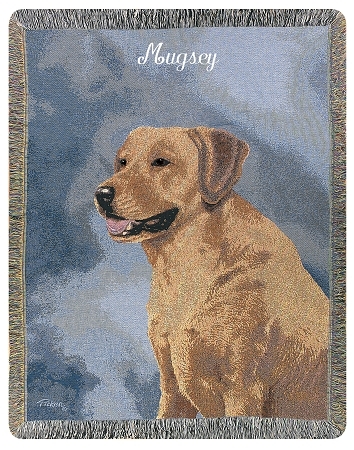 Our personalized dog blanket is machine washable and measures 50"x60". An oustanding gift for dog lovers! Availability: Personalized Dog Throws take approximately 2 weeks to personalize and ship plus transit time.